People are always asking me what we do to try and keep them happy during our transit on long-haul flights from Australia. In all honestly sometimes we nail it and we cruise along like champions and then there are other times I am lost for thoughts and words. I can guarantee that they will keep you on your toes for your trip but here are some ideas for what to take on long-haul flights, car trips and even a short plane ride. As I have said our first leg is a car ride to the airport. We have had morning flights for the last three trips and have flown out at 10 am. So we have a few things that we like to do to get the car trip underway! 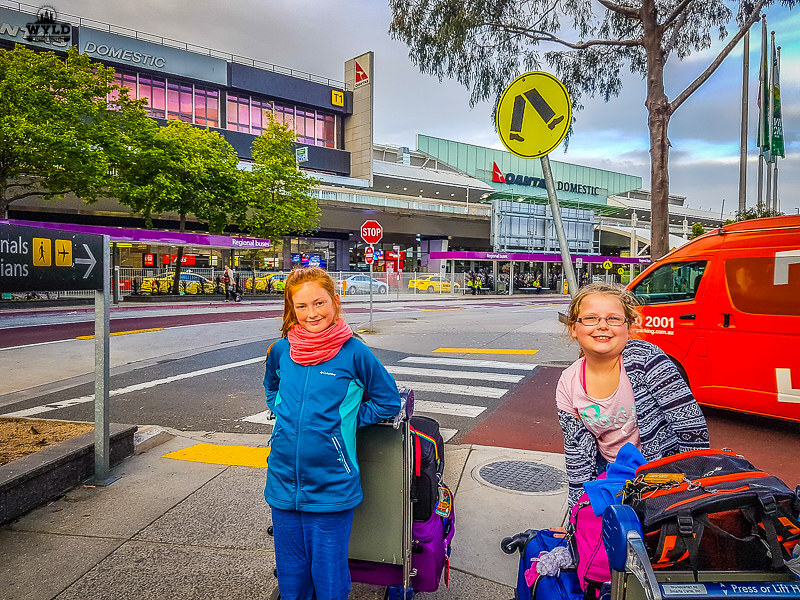 Mark and I have kept the girls asleep for as long as possible in their own beds before transferring them to the car for the first part of our long haul flight from Australia. They stay in their pj’s for the car ride and they both have their travel blanket in the car. I love their travel blankets and I picked them up from our local Kmart from the discount box. They are a blanket that can also be used as a dressing gown if need be and I find they are great in the car to keep the girls warm and snug while they sleep. The night before flights with kids I have also packed a light snack as by the time they are put in the car they are hard to get back to sleep once the journey has started! It normally has yoghurt (the squeezy ones that should make no mess) fruit and rice crackers. After about an hour they both normally fall back to sleep for a while. They have their slippers on and some socks to keep them warm in the car. I try to get some slippers that have a flexible rubber bottom on them. They are still lightweight but are great for when they are on the plane and want to walk around too. I have a bag of the clothes that the girls will wear once reaching the airport car parking in the car and take them inside to have a freshen up and get changed into. I find this easier as then I am not rummaging around in their luggage to get a change of clothes out for them. It also leaves room in their backpack for another change of clothes and the pj’s so they can wear them on the overnight leg of the journey. I then put the old pj’s into a bag and put them into their backpack and roll up the blankets to be put on their bags like a swag. By this stage, they are both pretty happy and have not had to use their electronic devices as we try to save them from the airport. Chatting with some of the people around you. I started chatting to a little one in a pram last time we were in line as they were getting really upset and this took the pressure off their parents so they started talking to our girls instead! While it only lasted about 15 minutes it was 15 minutes less we had to hear the same thing. It then bought in other people around us and before we knew it we were chatting life stories! For some of the wait, we let them sit on the luggage on the trolleys. I know this is a big no-no but by this stage, they are getting to the point where they contemplating an epic meltdown and there is nothing I can do to stop it. Our girls get bored very quickly at the airport. This is when we usually try and find a place for them to sit quietly and play their devices or we try to get a place where they can see things going on. The line up to check in the luggage can be the longest time, especially with a very impatient youngest child! I find those play areas are hard to come by until you have checked your luggage and gone through customs in Australia. Once through passport control, we try to find a play area where we are able to see the girls and sit ourselves to re-organise everything we have just had to pull out at passport control. Mark will normally go for a walk around with the girls to watch planes come and go and they love that for a while. Because we are going to spend so much time with each other on the plane this is really the only time we try to separate the girls for a while and give them some space. We sit and have something to eat. It may just be a little snack or even a treat but it wastes some more time. We have a look at all the duty-free shops and they pick some souvenirs that they can take to give to friends. It costs a small fortune but they love it and it normally takes them a good 20 minutes of wandering before they get the perfect gift. As much as I spy can get boring in any situation we find Air Spy much more fun. You have to see how many different airlines are around or taking off or different uniforms that are walking through the airport. Then you can talk about where they are from and maybe where they are going. This is where it gets hairy for us. That tiny little seat is painful for the shortest of times but when you know you have hours in it, it adds to the pain. We have been so lucky that we have all been sitting together as four across the middle or two and two. My number 1 long haul flight essentials is to have a neoprene laptop case with everything the girls will need in it. I get that straight out of their backpack and sit the kids down. It has a lollypop, book, tablet and anything else they may need. The good thing that even though the girls are getting older we are still invited to get on the plane after the families with younger children and I can tell you we are always grateful for the invitation. 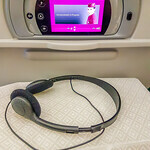 Until we are in the air this is where the devices get the most use. I try to keep the colouring packs that they give out intact as there are other short flights where there is no children’s entertainment available for them and they are brilliant for then. We normally get their blanket and pillow out on this flight as well to let them get comfortable if they need to rest and it helps them settle into their little space better. We have tried cards before but some other passengers may not like the noise that goes on with it especially if someone is cheating! Kids Earphones are also great as they can just listen to music on their tablet or watch a movie on there if there is no entertainment. I find that it is rare that carriers don’t have some sort of activity for children so if you are booking a flight you really need to make sure you book anything they offer for kids. It seems whenever we have a stopover it is measured in hours and hours and hours…we are very lucky though as they have been in the same airport all 4 times (I am slightly scared this time though as they are small stopovers and measured in minutes!) So we have been able to get better over time. The Koi pond is just magnificent…if you are visiting Changi. My girls could have stayed there for hours before heading over to the butterfly house. We try to get to the gate and settle there well before our flight is even ready. I find this helps as the girls are starting to get tired and grumpy. They can then take off their shoes and put on their slippers and really get comfy. Just before we board I get them another snack and a drink that will tie them over as they rarely want to eat at this stage. I then take them to brush their teeth and by that stage, we are ready to board. 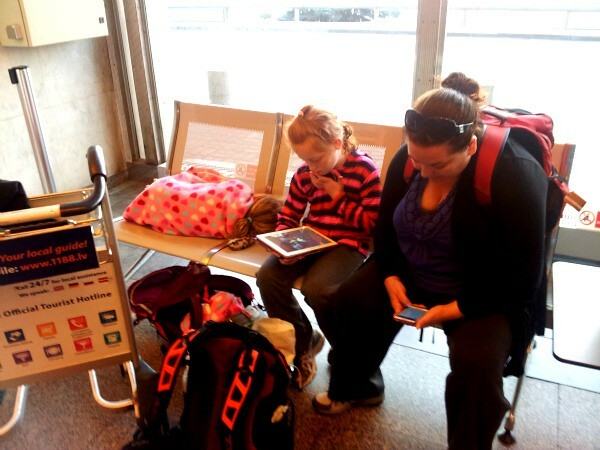 Travelling with kids can be easy. You just have to be organised and at times you just need to go with the flow. If we feel pushed ourselves it must be such a hard situation for little people to be in too. Although it can be a stressful time it is also the start of a brilliant adventure that you are going to together and starting it the best way possible puts everyone in the holiday mode. I hope some of these tips have helped and if I have missed any I would love to hear what you think will help me next time! Bec Wyld born 1978 Mother, Wife, Ministry of War & Stress, Sangria Sampler, Souvenir Collector, Market Explorer, Bargain Hunter. I admire anyone that can travel long haul with kids- hell, can travel even short haul with kids! 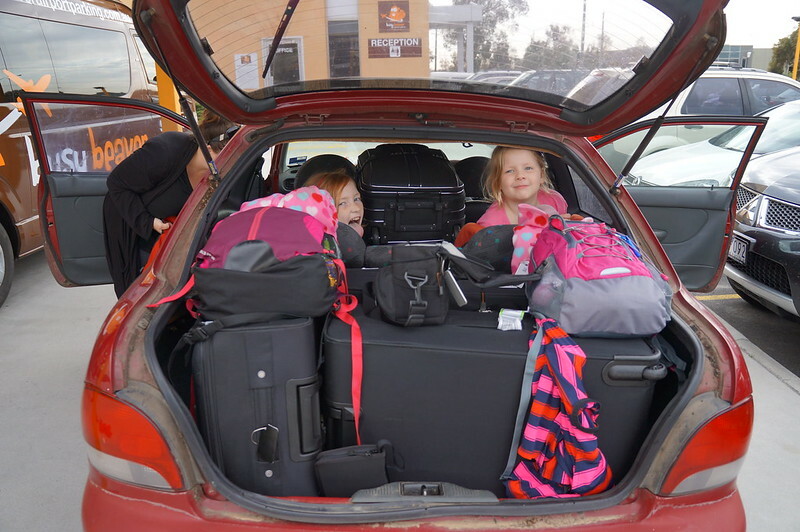 As my site primarily concentrates on solo travel and I’ve never had kids (just taught them), I often watch the juggling act that goes on with parents when travelling with kids – and I am in awe. Hi Rebecca…great name you have there! It can be a crazy juggling act at times especially when they are tired but ours are getting older now and they seem to be coping better with the long haul flights. I actually think they are worse on the short ones we have done on our trip! Thank you very much for leaving a comment! That is one long flight and one very full car! Well done on surviving the flight with kids too, I can’t hack long haul flights with my partner never mind with children too! And there is a pool at Changhi Airport?!??! Hi Katie! They sure do! It is upstairs, on the rooftop. There is also a gym up there where we normally go and have a shower before we get on the plane for the nighttime 14-hour stretch, it always feels so good on the way home. And sometimes I think Mark can be just as much work as they girls! Our poor car does feel the pressure when we announce a new trip too! Thanks so much for your comment! How amazing is Changi airport? I’ve yet to transit there now that I have kids but I loved it nonetheless. I’ve always loved exploring airports – if we get really bored and there’s still heaps of time left, we sometimes fork out money to go into the lounges. Totally worth it in some airports! Hi Tina! We have never forked out for the lounge but it may be something we do after we stop travelling with the kids! Changi is absolutely amazing and there is always something to do in there. We love the airports too and we always say to the girls that once there the possibilities are endless!